Just as with previous launch day activities for Apple's previous iPhones, such as last year's iPhone X release, customers in Australia entered their local Apple outlet to acquire the device right after stores opened. 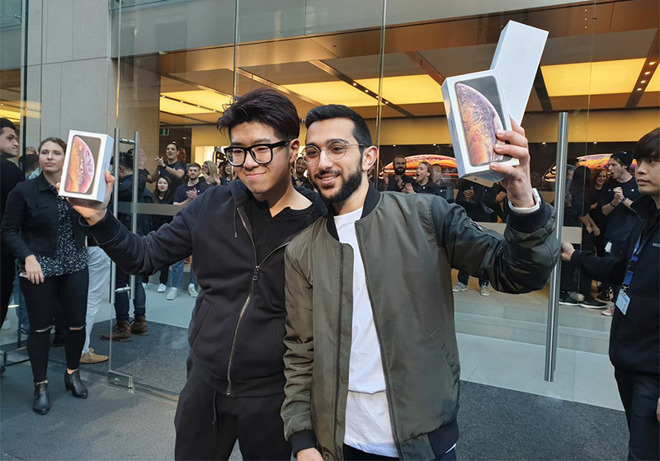 The first iPhone XS retail sales in the world came courtesy of Apple Sydney. As captured by CNET reporter Claire Reilly, the initial retail units appear to be a pair of iPhone XS Max devices, as well as an Apple Watch Series 4. Apple on Thursday sought to stir up excitement with a press release noting the new hardware is now up for sale in brick-and-mortar stores. 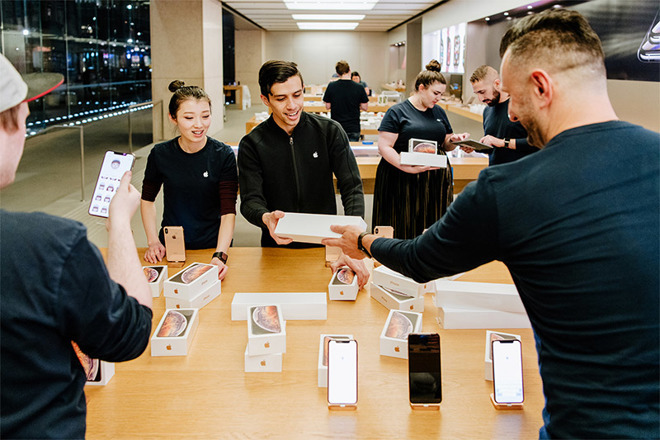 Accompanying text reminding readers that iPhone XS, XS Max and Apple Watch Series 4 go up for sale at 8 a.m. local time on Friday, Sept. 21, the company shared a photo of Apple Sydney employees readying their store for an expected influx of customers. Apple's media page will be updated with more launch photos throughout the day. In Australia, the iPhone XS starts from A$1,629 ($1,188) and the iPhone XS Max starts from A$1,799 ($1,313), while in New Zealand, the iPhone XS and iPhone XS Max start from NZ$1,899 ($1,270) and NZ$2,099 ($1,404) respectively.The prices are considerably higher than the United State's starting prices of $999 and $1,099, but they do include local sales taxes of 10 percent in Australia and 15 percent in New Zealand. Sales are expected to commence in other countries as each time zone passes, though midnight launches are not guaranteed at every retailer offering the devices. Friday is also the day customers who pre-ordered the iPhone XS and iPhone XS Max will start receiving their devices. Customers started reporting they had received shipping notices for their orders on Thursday, with deliveries anticipated for Friday for those who ordered early enough in the process.